This has to more to do with feel that the quality. Laminate floors are hard on foot and are therefore not an option for anyone looking for a floor that is soft on the foot. Some people opt to include a foam underlay to reduce the hardness but this only works to a small degree and the hardness can still be felt especially when compared to other flooring options like carpets or cork flooring. It is true that laminate floors have a wood cheap base. The truth however is that this type of flooring is not real wood flooring even if the floor might resemble real hardwood floors. While this might be okay to some, homeowners who prefer real hardwood floors will not like this flooring option. This is especially true where earlier versions that had a smooth finishing are involved. Modern laminate floors manufactures are installing an anti- slip layer at the top to counter the problems experienced with earlier models. While the anti- slip layer is adequate, the flooring option is not is not ideal in instance where slippery floors have to be avoided at all costs. Also, once the anti- slip layer wears off, the floor gets slippery. Laminate flooring should therefore be avoided in areas prone to spills or any other factors that can turn the floors in to a health hazard. Laminate flooring is known to be among the most durable floors that age well and still look good after years of continuous use. Some manufacturers guarantee their laminate floors for up to 30 years and this just show how long these floors can stay intact. This floors durability can be attributed to a number of factors one of them being the wear layer on the surface that protects all the other layers against damage whether from the effects of weather or frequent use. Accidents however might occur where the floor gets deeply grooved say when moving a piece of furniture or equipment. The floor can also get heavily worm out if it is not properly cleaning and maintained and where debris and dust particles are left to accumulate on the floor. Where such situations arise, the floor has to be replaced. This is unlike other types of flooring like wooden floors that can simply be refinished and still look as good as new. This is true especially where the floor shows signs of wear and tear. Unless you replace the floor, the resale value of your house is going to be much lower than that of another seller who has a refinish-able floor that can be refurbished when the house is on the market. Even where the laminate floor looks as good as new, the floor is cheap and easy to install. This means that this flooring add little if any value to the resale value of a house. 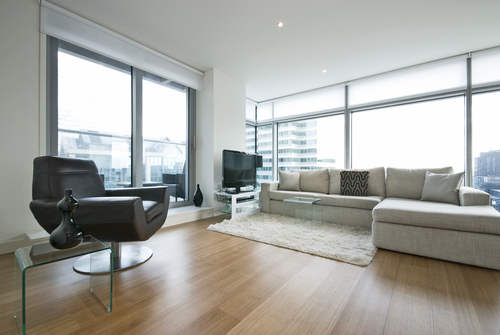 Regardless of the shortcomings listed above, laminate flooring is very common in many residential and commercial establishments. This can be attribute to the many benefits that come with this flooring option far outweigh the shortcomings. 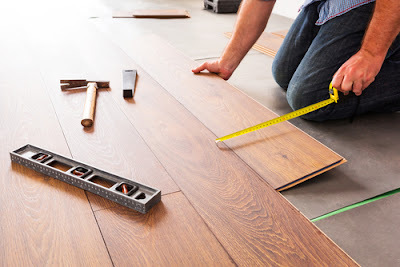 The fact that the floor is very affordable, easy to clean, does not stain, come in different designs and patterns to suit different users tastes and preferences, and can be installed on top of existing floors makes laminate flooring the flooring of choice for many homeowners and business owners who are either putting up new establishments or remodeling their old ones.